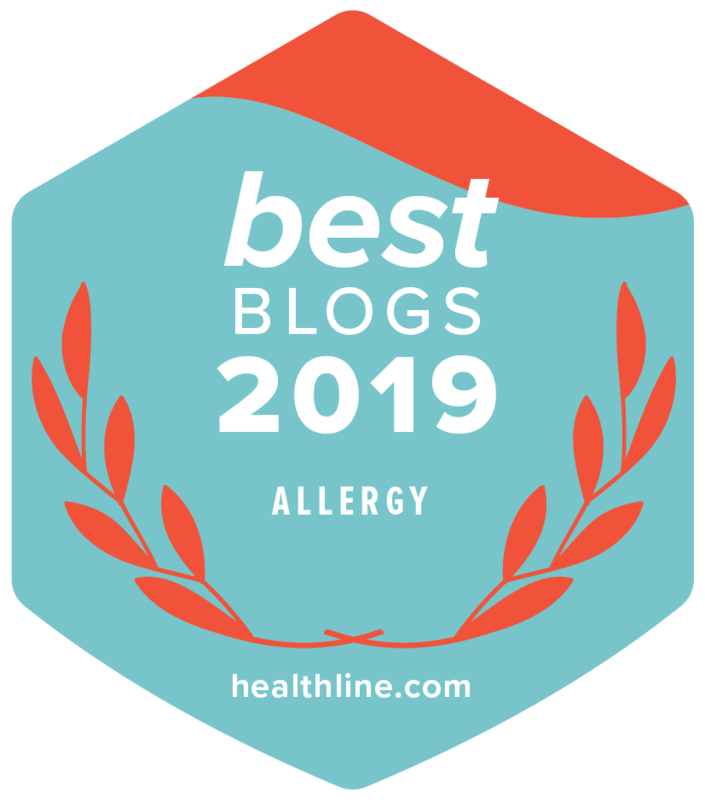 Eczema Flare: Could it be Food–Pollen or Food-Food Cross-reactivity? Tristan is having another bad go of it. I know his skin flares up each April during the beginning of allergy season, mostly around his face, neck, and wrists as opposed to behind the knees and on the legs, belly, and back like with his food allergy triggered eczema. We’re fairly sure this spring reaction is due to an allergy to birch and grass pollen, but we need to have this diagnosed with a skin test (here’s hoping his outdoor allergies can be diagnosed via allergy testing as his food allergy tests were always inconclusive). I was commenting (ok, more like complaining) over Facebook about Tristan’s sudden flare-up and Tracey from Nutrimom suggested it could be synergistic foods. I’d heard a little about this before, but was intrigued and of course desperate to get to the bottom of this latest flare (as I’m sure you can all understand), so I did some more research and came across some interesting information regarding concomitant and synergistic foods. Very, interesting – I had to know more. Corn & banana – bad food synergy. From what I found, it seems synergistic foods can go one of two ways – helpful or hurtful to the body. Many foods like broccoli and tomatoes, when eaten together, can give the body the exact right combination of nutrients to ensure the body processes these foods in the most beneficial way possible. However, some foods can have the opposite effect, when corn and bananas are eaten together, they can be harmful to the body and could cause an allergic reaction, even if there is no individual allergy to corn or bananas present. Could this be what’s triggered Tristan’s recent eczema outbreak? It’s certainly possible, but since it’s now grass pollen season, I think it’s more likely that Tristan’s flare was caused by concomitant food as described below. If consumed while someone is exposed to pollen, concomitant foods have been known to trigger an allergic reaction in any form, including eczema. This is different from Food-Pollen Allergy Syndrome and Oral Allergy Syndrome where reactions are localized to the mouth or throat and can cause anaphylaxis. Right now it’s grass pollen season, so we’re going to eliminate some of the foods in the grass concomitant food row for a few days and see if we notice an improvement in Tristan’s skin. Bye-bye apples, carrots, peas, and celery. He’s not going to be happy about the apples, that’s for sure. If we see a difference we’ll try the foods cooked and see how he reacts. Many times cooked concomitant foods are processed with no problems. And of course, as soon as grass pollen season ends, we’ll bring back in the eliminated foods. Do you have any experience with Synergistic or Concomitant Foods? We have an unconfirmed sample of this with my son. Last Fourth of July, he ate watermelon and his throat started to close up. Previously, he was able to eat it with only hives on his face (which we assumed was just from the juice). His allergy specialist had mentioned that ragweed was high at the time and it may have been the culprit. The only bad thing is that I don’t want to try it again because the reaction was so fast and so scary. 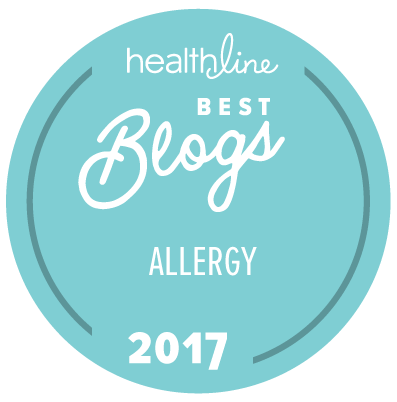 I have noticed with my allergies foods seem to make them worse when my diet is not optimal. I get a dailt email from Pollen.com so I try to avoid the foods that will add to whatever is in the air. Wow! Very frightening. I don’t blame you for avoiding watermelon. Just signed up for pollen.com – looking forward to their emails! Thanks! Interesting article. Our daughter has eczema but we don’t think it’s due to food allergies as eliminating has no effect for us. Her diet is so restricted anyway (she’s a typical 4 year old that way). I wonder what effect rapeseed pollen has…there has been such a huge increase in the number of fields covered in the bright yellow rapeseed. I used to love it but it triggers such a bad hayfever attack that now, I have to keep all the car windows closed until we are well past. Have you considered water softness and whether the water company are putting extra chemicals in. When I lived in SE London, my daugther’s eczema would get worse at odd times.I always wondered if it was the water as you could literally smell the flouride on certain days. Ironically, things have got worse since we moved to Scotland as the soft water doesn’t remove soap as well…so now her hands are permanently covered, as well as her shoulders and sometimes the “hot” spots (knees, small of her back etc) and I’ve had to change shampoos as the water here was causing my hair to itch so badly with my old shampoo. Did you know that rapeseed is genetically modified? I wonder if that somehow adds to the pollen levels or changes the pollen in some way. Interesting. We have thought about water as we have moderately hard water. When his skin was severe, water would aggravate him so much, but now it seems ok. Luckily we live in a city that does not add flouride to the water. I hope you figure out your daughter’s triggers! I thought we had it figured out, but we always end up with another trigger that we have to identify. Eczema is such fun! I was searching the web for that concomitant food list as I am not at my regular computer and stumbled on your post. Every spring I have 2 really bad days where I’m walking in circles and can’t accomplish a thing or end up in a heap on the floor before I’m reminded I need to look up what foods to avoid. I do all manner of things for my allergies and they have steadily improved over the past several years but still I can get dysfunctional during heavy spring pollen until I remember this one more thing I can do. The pollen.com alerts only tell you the highest 3 pollens. However, pollens for various plants are building/waning before/after they hit the top 3. When I was trying to figure this out a few yeas ago when it really was a huge issue for me for 2-3 months every spring (image how you can screw up your life if you can’t think straight for that length of time annually >8O)… anyhow I mapped the pollen alerts… shoved them in a spreadsheet.. dates in the columns… pollens in the rows… and assigned different color cells to the individual pollens that specifically affected me badly from the pollen alerts. I only did this for the time of year that affected me worst. The following year I was easily able to see which pollens were surely building but not yet registering on the pollen alerts and could look up what not to eat if I was having trouble… that was a game changer for me. If you chart that just once for your particular area and keep the spreadsheet even though the dates may shift annually due to climate differences, the pattern/progression remains the same. Don’t forget the pollens are slowly waning too so I stay off the relevant concomitant foods until I think it’s probably OK and test that food to see if OK to add back in. I test food at night so I can sleep it off if it sends me for a loop. My allergy testing was at Dr. Lieberman’s office and boy was that an enlightening experience. They don’t test everything all at once like regular allergists do. I was surprised that a couple things that affected me the worst I barely had any skin reaction to. One round of that testing made a believer out of me. I got so stupid on one substance that I probably had the IQ of a potato… I could barely form words.. after it cleared I remember saying “that was March stupid”… it was Birch pollen… which does happen in March here. A particular mold turned me into a tasmanian devil… I was AMAZED how quickly they were able to reverse that. It was truly shocking how some things affected me, there was someone also getting tested who just got the sniffles, or their foot itched, while I was flipping between extremes. Dr. Lieberman’s allergy approach has done wonders for me but at this time of year I always eventually get reminded to refer to the foods that can make a reaction exponential. After I do that, spring is just a mild nuisance instead of a horrifying annual event. Years ago I literally thought I was going nuts when this started happening to me until I realized “nuts” wasn’t seasonal. I wasted years under the care of a regular allergist because I didn’t know any better, it helped but was nothing compared to what Lieberman was able to do for me. I don’t want anyone reading this to think Dr. Lieberman’s approach isn’t the holy grail of allergy approaches… because it really was for me… it’s just that I test “off the chart” allergic to some things that bloom this time of year and for this one season of the year I have to pull out the stops and pay attention to everything… but then it’s OK.. small price to pay. I thought hearing about this just might help some parents out there struggling with allergic children… every time I saw a kid getting tested in Lieberman’s office I’d smile and think “what a lucky kid”… far better than getting poked full of drugs all your young life and/or put on ritalin etc. for “behavior problems” that are actually allergic reactions. I’ve had a 15 year journey with my son’s terrible allergies, eczema and asthma(known as a triad by doctors). So bad. Everything made him flare up. His teeth were rotting too. He had root canals starting at 8. But I now know his teeth were a sign of this triad. I have never heard of the concomitant and synergistic foods. That would have helped us along our path to healing. I would love to share some of our successes to help others. First, if you have allergy history then things to avoid in infancy are antibiotics and chlorine, as in swimming pool. I WISH I knew because I unknowingly set my son up for problems because he was predisposed to this triad. I know so much more now and would have used natural remedies instead of antibiotics. This info has been studied. Take probiotics while pregnant. Also, a huge factor in this is candida. I had it so my son did. That destroys your immune system. I tried everything throughout his life so far. Simply put, nothing worked until after I got rid of the candida and gave him very powerful immune boosters. All monitored by a naturopathic doctor who’s had over 30 years of experience with this. Also, we eat as clean as possible inside our home and take GOOD probiotics and multivitamin. I make immune teas and now we get sick a lot less often. Another mother said to me when they start puberty is when things improve with asthma. Yes, it did for us but I can’t say not with out all the work we put into healing him. Finally, he was so much improved but I couldn’t get his asthma under control. That’s when I took out milk(I tried food elimination when he was a toddler with no success). When I did that the last of his lingering eczema disappeared(he had it from head to toe before ridding him of candida) and with good food based vitamins the asthma is getting less and less with each passing allergy season. Now he looks and acts healthy. His immune system is now working for him. A neighbor said it’s the first time she’s seen color in his face and a sparkle to his eyes. For the first time in his short life he can participate in physical activities and tolerate the outside. Boy I could cry writing this. Don’t give up mothers. He is a living testimony of my constant search for answers when the doctors just prescribe more steroids. I know this is choppy. It’s hard to cram in the last 15 years. We’ve come so far and learned so much. I want so much to help other mothers. And, ask me anything. If I know I’ll tell you. If I don’t I’ll tell you too. By the way, all his rotting baby teeth are gone and in their place are healthy permanent teeth. I would also love the spreadsheet for pollen count too. My allergy journey isn’t over yet. But, I live in the dry west. Is your spreadsheet just for S Carolina? Thank you for sharing your story. How wonderful to hear how much you’ve done for your son and how much it’s helped him! Wow! So encouraging. The spreadsheet is not exclusive in any way – it can be used anywhere for any state that has those pollen bearing plants/trees. Hi There, honestly in my 35years experience first hand with eczema… and I’ve had it from a kid…. and bad flares with huge patches so itchy I’d wake up at night scratching and then weeping and bleeding, as a teenager it was so embarrassing and I’d have to hide it. This information will really help. I came across an elderly woman who sore my eczema sores and she said she suffered the same and her secret was that she took pork out of her diet completely…. she didn’t even use the same pan to cook her meat after she made pork for her husband, even to the point where she doesn’t eat sausage as it has traces of pork…. and she never had eczema again. What did I have to loose….. so I gave it a try! I swear I have not been happier that that old lady took the time to share her info with me. I didn’t believe it at first and then would try pork again (I love bacon) so just a few bits in my omelette and I’d flare up again badly. Give it a try with your kido, I do hope to help others as I was helped.